This past Saturday was gorgeous. Even better was Julia and Mark went to a Reunion for Mark's 40th Class Reunion from NMH and I was left alone with hours alone. 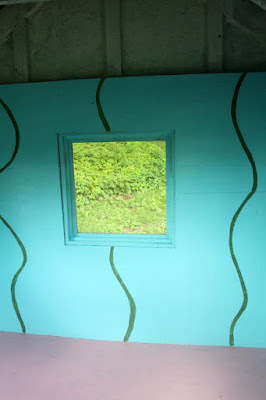 I went full tilt into working on the second She Shed for my upcoming book. I scraped the peeling paint on entire exterior and then washed it with a bleach solution. 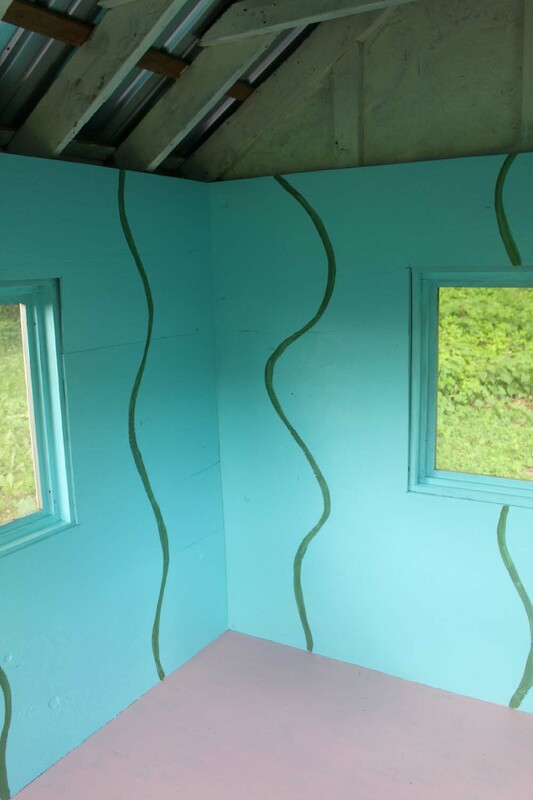 Then I went inside and painted the walls and floor. (I had primed the inside on Friday.) 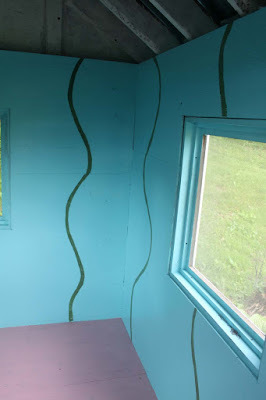 I had a whole lot of extra Poolside Blue left from the first She Shed so that made my color decision easy for the walls. If I didn't like it I could always change it. On the floors, I went with a pink which is really not me but lately I have been loving the combo of turquoise and pink. 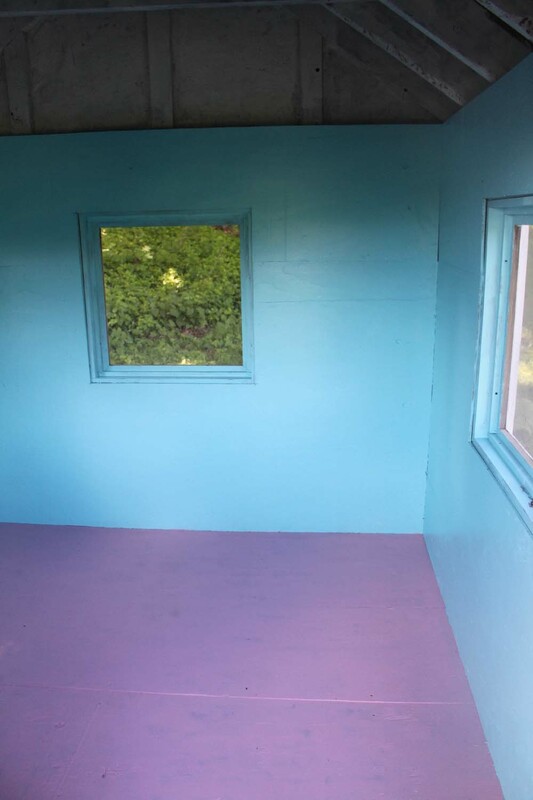 And this is a shed and I want it to be fun and colorful. I've got further plans for the floor too. By the time that was done, I went back outside and primed all the bare wood on the exterior of the shed because it was dry. It was a big work day Saturday. 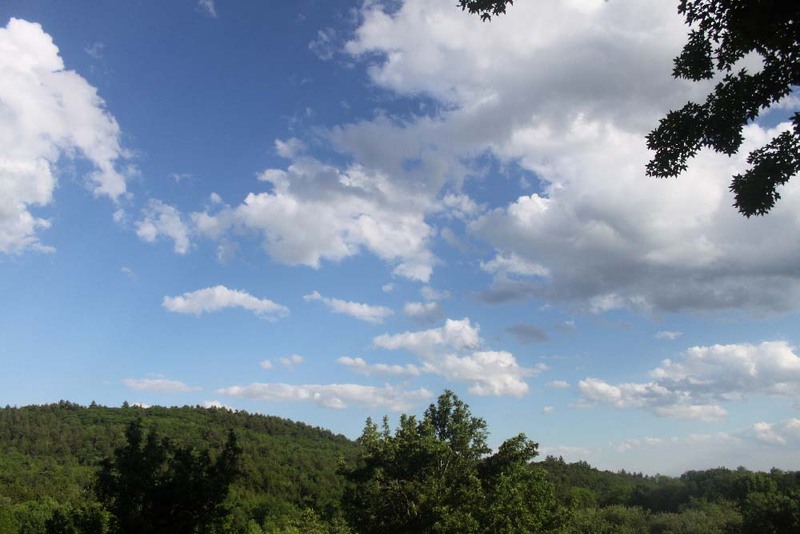 We had massive amounts of rain on Sunday so I'm glad I got so much done on Saturday. Yesterday I began with the decoration. The theme for this She Shed is Gardening and it seemed appropriate to do something "gardeny" on the walls. I began by paint undulating stripes down the walls. The shed isn't big - just 8 x 8 so the painting goes quickly. I primed part of the upper walls but it was too much to paint all the woodwork. I'm thinking of using some cans of spray paint for that - or maybe tenting the ceiling with fabric. Not sure what yet. I cut out a leaf shape from heavy paper and used it as a template. Using a pencil, I drew the leaves onto the stems. Then it was a mad dash to paint them all before dinner. I had just enough time to slap another coat of pink on the floor. When I went outside, I looked up and the sky was so pretty. 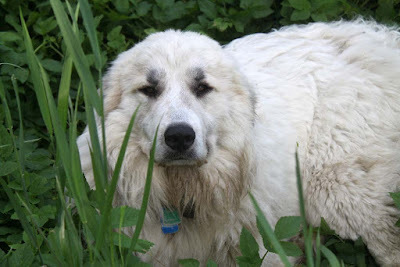 And there was Beau waiting patiently for in some weeds next to the chicken coop. Tuesday Farmer's Market in Northampton today. Maybe I will see some of you there. I'll be there from 1:30 to 6:30. Enjoy the day and the week everyone! 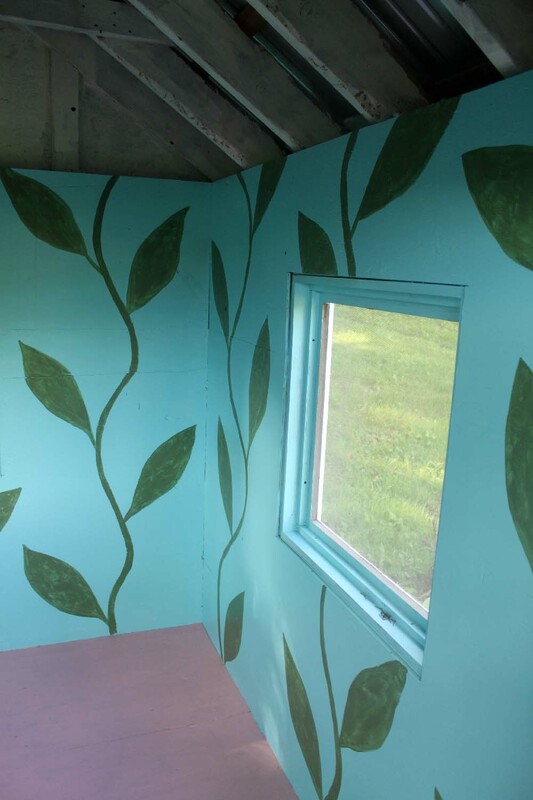 Dear Kristin, bravo to you on the transformations you've been achieving with color and paint! How wonderful to have some excellent weather to allow some intensive decorating. 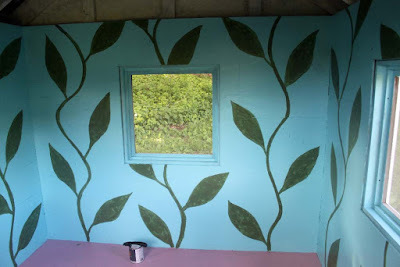 It is so interesting how your decorative painting on the shed walls really does play with the proportion of the spaces. I imagine that this effect is even stronger in person. You are so much braver than I am when it comes to BOLD colors. But it looks so inviting. I'm tired just reading your post. I feel soooo lazy. Your shed is going to be phenomenal! Love those bold colors. My shed is too crowded for fun - maybe I need another one! 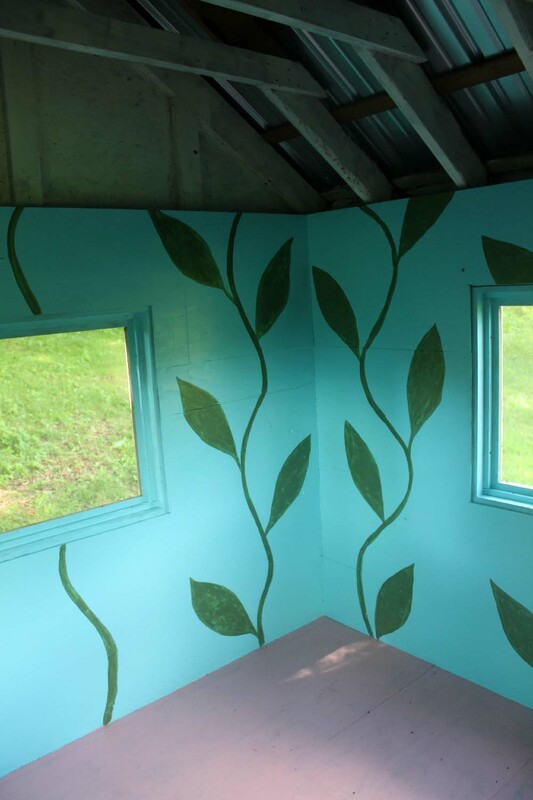 I will come back to your shed photos for inspiration when I start painting this summer; love the way you decorate! You are absolutely fearless. I love it!